Almost everyone considered Japan's Venus-bound orbiter a lost cause, but Akatsuki survived, reached its objective, and is wowing scientists with results. Its engine blew up seven years ago, and by all rights the Japanese spacecraft Akatsuki shouldn't have survived. However, engineers at the Japan Aerospace Exploration Agency (JAXA) refused to give up. The spacecraft not only survived its deep-space catastrophe, but it's now safely in orbit around Venus and producing breathtaking images of swirling clouds at multiple levels within the planet's dense atmosphere that have never been glimpsed before. 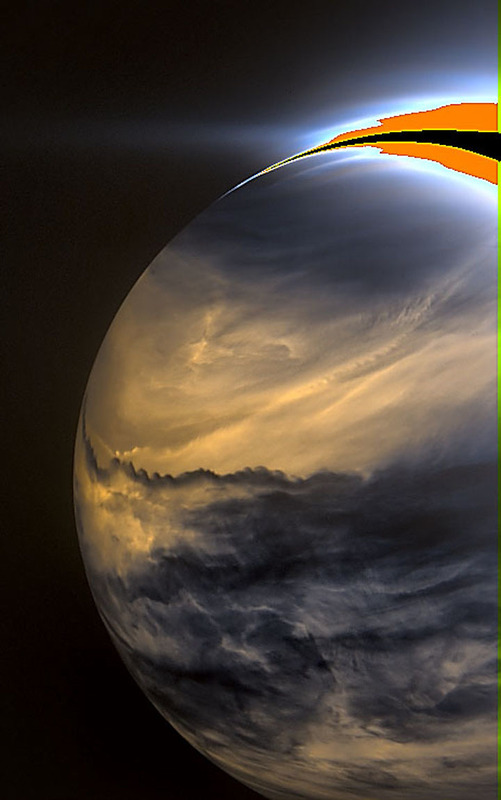 Scientists from the European Space Agency's Venus Express spacecraft, which circled the planet from 2006 to 2015, were amazed by newly released Akatsuki images and pronounced them "fabulous." Two of these appear below. 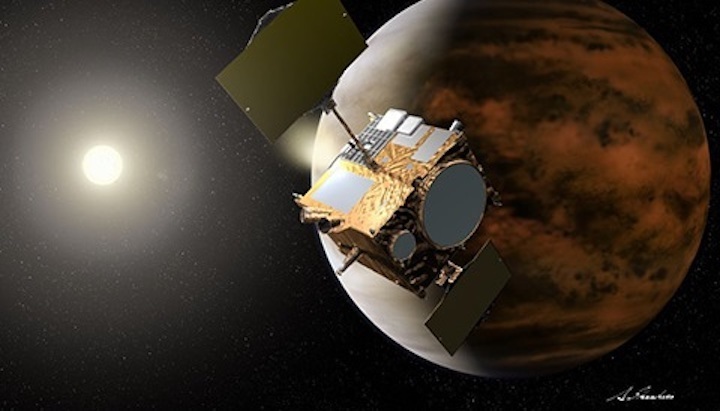 Akatsuki was supposed to reach Venus and enter orbit on December 6, 2010, using an innovative ceramic thruster. Unfortunately, the crucial engine firing failed in dramatic fashion, when inadequate pressurant flow into the engine caused the thruster temperature to increase until the nozzle cracked. The spacecraft autonomously shut down its broken engine only partway through the intended orbit insertion burn, and it sailed right past Venus. After determining that the engine wasn't salvageable, the resourceful team at JAXA vented all the remaining propellant to lighten the spacecraft and developed a brave plan to attempt orbit entry a second time. To make a long and dramatic story short, they succeeded. Akatsuki has been at Venus since December 9, 2015, and in its final science orbit since April 4, 2016. This very elliptical orbit has a period of 10.5 days, traveling from a periapsis of around 10,000 km to an apoapsis of 360,000 km. 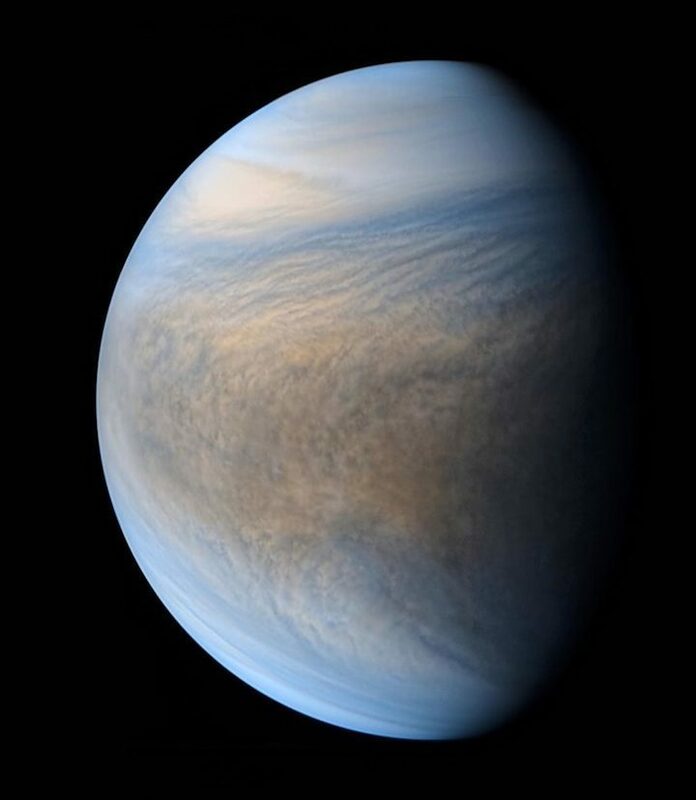 Project scientist Takeshi Imamura likens the mission to a weather satellite for Venus, perched high above its swirling clouds, with a multi-day vantage point on cloud motions. Damia Bouic, an amateur image processor, combined Akatsuki images taken through its UVI camera — at different distances — to create this composite. The brown region bristles with small convective clouds. 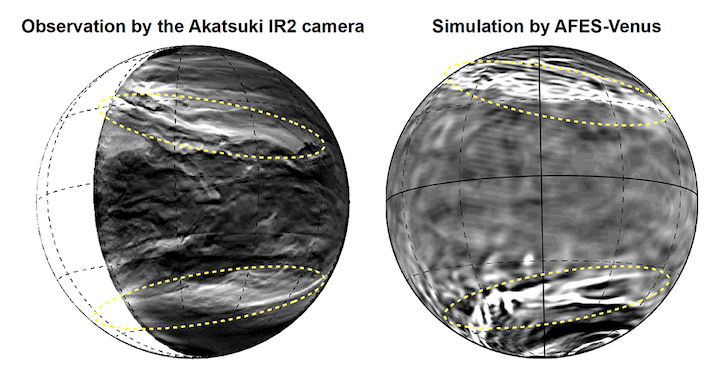 Akatsuki carries five cameras to view Venus in different wavelengths, each one penetrating to a different depth within Venus' deep atmosphere. These imagers have higher resolution than those on ESA's Venus Express. Akatsuki's ultraviolet imager records high-altitude clouds, illuminated by sunlight, at the wavelengths of 285 and 365 nanometers. Drifting along at elevations of 65 to 75 km, these clouds consist mostly of sulfuric acid (H2SO4). Their patterns are outlined by the presence of an as-yet-unidentified "ultraviolet absorber" that is especially dark in the 365-nm images. Meanwhile, the shorter-wavelength (285-nm) images are more sensitive to the presence of sulfur dioxide SO2) that rises from lower down, surviving in the upper atmosphere only briefly before solar ultraviolet radiation breaks it up and atmospheric chemistry recombines it into other molecules. 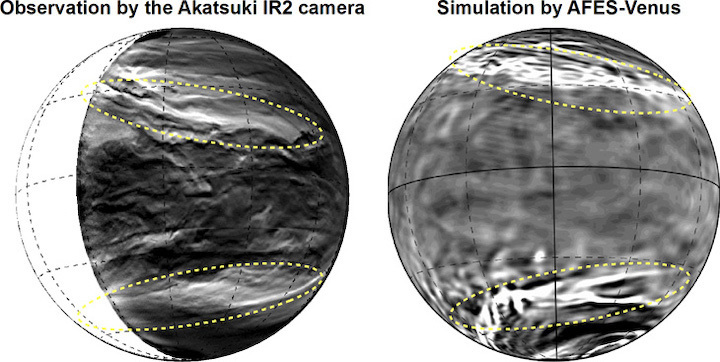 Akatsuki's IR2 camera acquired this view of the night side of Venus. Infrared energy from hot, mid-altitude clouds shows up bright, while higher clouds that block the heat appear dark. The dark sawtooth at center appears to be a turbulent boundary. The planet's sunlit crescent is overexposed at upper right. The infrared cameras (IR1 and IR2) need no sunlight to see Venus. They observe in wavelengths at which the hot atmosphere radiates thermally. IR2 has two channels, 1.74 and 2.26 microns, which detect heat at a still-high 48 to 55 km above the surface. Seen at these wavelengths, dark features are higher-altitude clouds that block Akatsuki's view of the glow of the warm atmosphere lower down. Researchers suspect that the motions of clouds at these mid-level altitudes are more sensitive to topography lying far below. Unfortunately, the two infrared cameras (IR1 and IR2) suffered an electrical fault in December 2016. But the long-wave infrared (LIR) imager, Lyman-alpha camera (LAC), and ultraviolet imager (UVI) all still function. Late in 2017, the mission made its first release of science data to the Akatsuki data archive. That's when Damia Bouic, an amateur image processor in France, delved into the raw image files and surfaced with the data that she used to make these remarkable views of Venus as seen through the ultraviolet and infrared cameras. View more of Bouic's amazing Akatsuki reconstructions here (and visit her website here). Even more Akatsuki observations are readily available to the public, waiting to be explored and enjoyed.